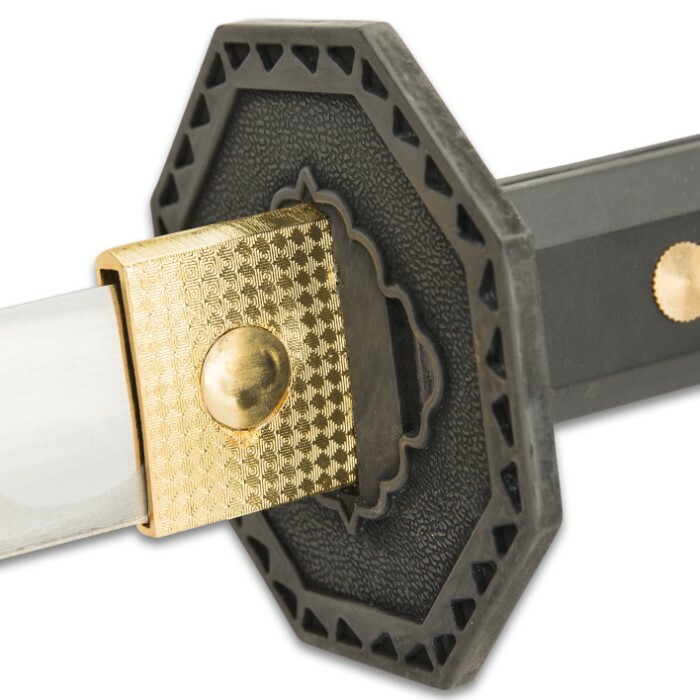 Crafted for the classical sword collector who appreciates functional performance! Featuring one piece of solid 440 stainless steel stretching from end to end. Each piece also features hardwood handles with brass tang guards and rivets. The ebony finished hardwood scabbards are sleek and stylish. Includes a black hardwood display stand. Katana: 39 3/4 in. Overall, 28 1/4 in. Blade. Wakisashi: 25 in. Overall, 17 in. Blade. Tanto: 18 3/4 in. Overall, 12 1/2 in. Blade. 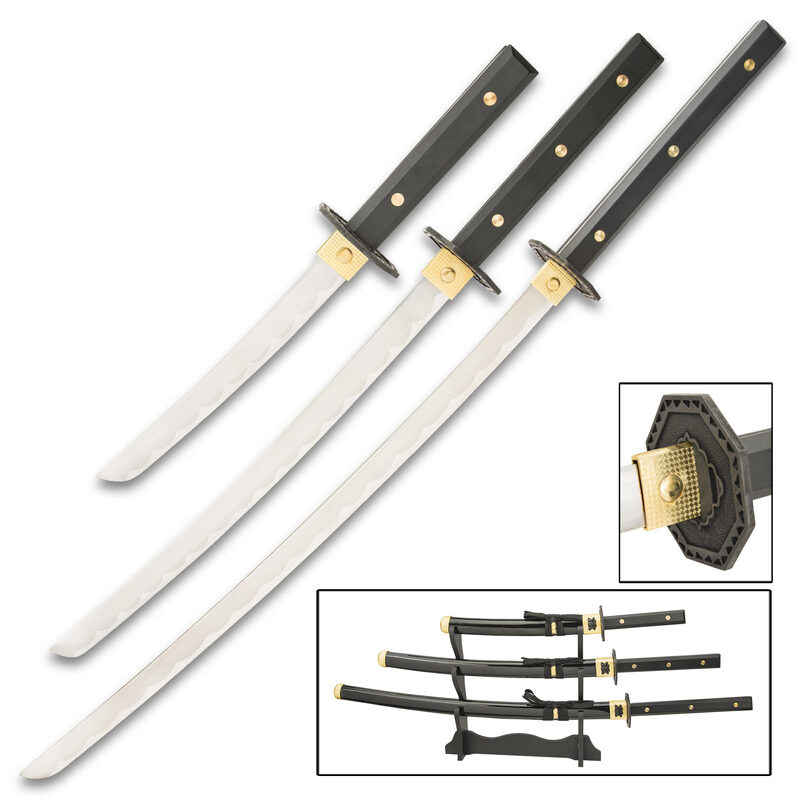 While this sword comes unsharpened from the factory, the blade design appears highly aggressive in person and could be honed to a sharp edge depending on your usage needs. They can't really mean functional performance when the blades come in dull to the point of nearly being flat... The set looks nice and has good feel. Just would've like to know they wouldn't be sharp at all before ordering. Seem to be well constructed otherwise. Nice set for appearance only. I like the swords, cuz they are nice but the made in china on the blade is hard to miss, and the blades are hard to pull out of the scabered so mutch infact that when i first got them i had to have my friends HELP me pull each on out. other than that these are amazing swords. This set are the first thing I've ordered from True Swords,& may I say, the swords look amazing. I've collected samurai swords in the past, but lost them through moving. The set sits on my headboard of my bed and look like they belong there, I ordered them on June 3rd, 2012, & other then a slight problem with fedex's tracking number, the set got here the following Wednesday. 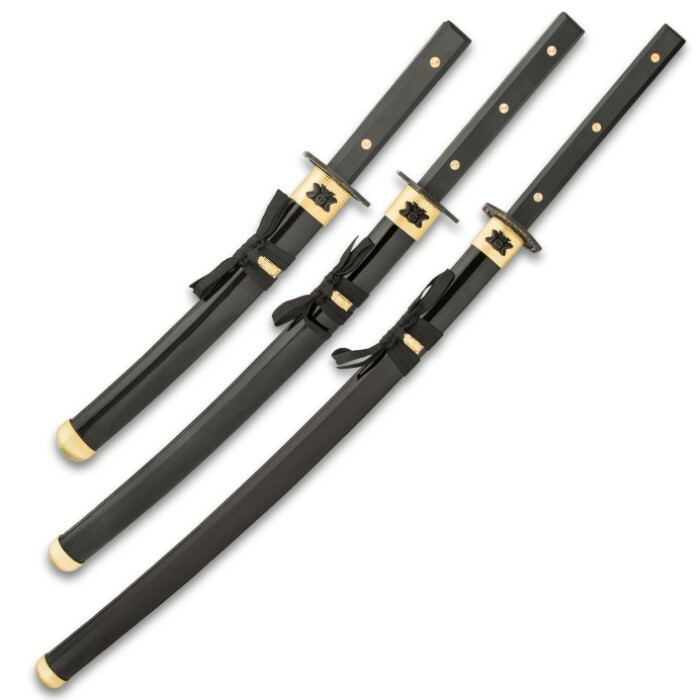 If you're looking for a good start to your sword collection, I'd recommend these! I Just ordered the Sword Sunday and got it today Wednesday, very impressed with the shipping time, but the only thing is i ordered these Swords and i got an entirly different set the swords i got are still amazing from what i can tell the one i got is easly a good subsitute and is probably worth the same. The only problem is that the stand i got with its is not the same in the picture it lookes like some 7th grade woodshop project, other than that i am very impressed and very pleased, i recomend this to any sword lover even if you get the wrong one it is still a great deal. I have been wanting this set for some time and it has been sold out for some time but i finally have it. The blades are all well made and the hard wood handles make a great addition to the over look of the blades. The weapons themselves are well made and quite solid. i was a afraid that they would be light and not well balanced but i was very glad to be wrong on both points. i would recommend this set to any collector who wants to add a nice piece to their collection.